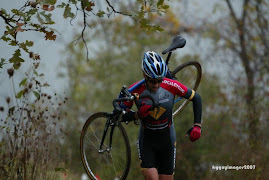 The 2 races in Lincoln Nebraska mark the end of my 'cross season, basically, for this year. 19 races over 10 weekends. Headed up with 360's Shad Shriener so I raced Open both days. Saturdays race went great. Brian Jenson and Shad Shriener were off early and racing against each other. Got into a great battle for 3rd place with Jesse Peterson and Matt Farnham. I started feeling the pinch with about 5 laps to go so I had to let those 2 go just as Troy Krause caught me. Me and Troy worked together for a couple laps and actually started catching back up to Jesse and Matt on the the last lap. Troy put in one sharp attack on the final hilly grass section before the long fast paved finis. I just about came unglued but held his wheel and was able to get him in the sprint for 5th. Brutal hard way to finish a race, and I was completely wasted. Good pizza and beer in downtown Lincoln finished off the evening. Day 2 was a bit more intersting. Jenson and Shriener once again off the front early and nobody really was interesting in trying to hang with them. The battle for 3rd was hot with me and 3 others. I was pretty wrecked from the day before so I had to ease up and put it into cruise mode early. Alone in 6th for a few laps before Nate Woodman came up. Managed to get 2 pair of WarAxe socks on Hooligan Hill (hence the above Pic courtesy of Cornbread). Right before Nate caught me, I slid out in a turn and peepled the back tire off the rim. Yes, same problem I've had before running too low pressure. I slid out pretty hard and the second it caught and hooked back up, off it came. Took forever to get it pushed back on. This happened before the run-up on the far side of the cause so I had a long way to go to the pit. I eventually got it back on put had to let most of the air out. Should have just un-did the rear brake and rode it., but.... ended up dropping to 10th in the 5 minutes or so it took me to get my pit-bike. Got going again and got 1 guy back, and could see 2 others up the road. Unfortunately Brian Jenson came up and lapped me, so I couldn't chase then down. Ended up 9th, the last money-paying spot. Few other low-key races this season but this was the bulk of it. Heading back to California this week for a nice Thanksgiving vacation and a full week off the bike. After nearly a whole season of dry fast races, we were finally treated to something quite slick. Nice steady rain turned a very fast course into one where pure horsepower only put you sideways or down altogether. In the Masters 30+ race, the long start on the cobble road was quite slick and a bit sketchy. A bit of elbowing put me onto the grass in 2nd. I blew the very first grass left turn, which wasn't there when we set the course up the day before. That put me 50meters behind Tige Lamb with Brendon Jenks right behind me. The course was still sticky enough to offer some traction so I got back up the Tige and went by him before hitting the long run-up for the first time. I led the the rest of that lap but we and Tige swapped leads a couple times each lap for the whole race. As the race went on and the rain kept coming, the course changed drastically. By the last couple laps, traction was hard to find and turning was just a best-effort situation. I was super fit and felt strong but just couldn't get the traction to move forward or attack anywhere. Tige was riding the muddy turns way better than me but we stayed together hitting the bell lap. All was going good until the little "run-up" that we actually had been riding every lap. On the approach, my front wheel just greased out and I came to a complete stop. After running up that and remounting, Tige had a 50 meter gap that I couldn't do much to reduce. It stayed until the finish. Tige first, 2nd place for me with a hard charging Adam Mills rounding out the top 3. As the day went on the rain only got worse the temps dropped. I was signed up for the single speed race, but my first single speed race will have to wait. The primary bike was a mess, and the tires on the pit bike weren't up for the mud. Not to mention myself not really up for another hour of cold rain. 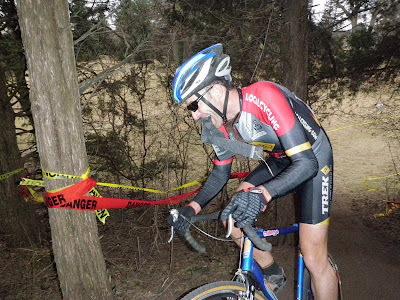 By the time the single speed and mens open race got going, temps were down into the upper 30's. Very cool course, very MTB'ish in my opinion. I like that. The start was back on the long cobbled road. I made it up that and onto the grass first with Doug Plummer right behind me. Once on the grass, I cruised a bit to recover from the hard start. After the first set of barriers was the first of 2 long grass climbs. I pinned the first one, coasted down the other side and pinned the second one. After that I had to cruise a little bit and take a quick inventory of where everybody was. 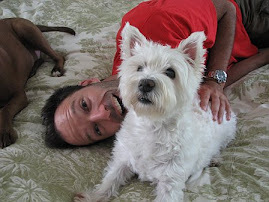 Doug was still really close. After the 2nd set of barriers, the couse dropped down a hairy section through the trees with a nasty S-turn around some trees. The course tape never stayed up very long there. Down by the pond and up a series of grass/dirt turns. We didn't enter the cobbled road at the very bottom this year, but about 1/2 way up. I used the 2 grass hills every lap and the rest of the course to recover somewhat. Hung up for the Masters 35+ win, but Doug wasn't very far back. Racing the previous night and early again this morning was tough. I'm pretty thrashed. Hopefully some cooler weather rolls in soon. It's tought to sweat like that in November. infield was a bit green during the preriding. The track hadn't been used in months. A bit bumpy in spots but everything smoothed our considerably during the night. A tight little s-turn right after the start on just before the entrance to the track kept the entrance speed down. However, that speed quickly built up with a long flat drag to the first 180 turn and back. The the infield minefield consisting of some tricky bumpy turns. Back onto the dirt track for one last stint of speed before a very trick, and aukward stair run-up and quick remount before dropping down outside of the dirt track. A quick climb back up the start area, another stair run-up right before the finish. I got to the start a bit later than usually and sorta had to weasle my way into the front row. Both Andy Lucas and Steve Songer got off the line first and up the first grass hill. I rode the course tape a bit and got passed Steve, then dropped in on Andy going into the little chicane. Once in the lead, I tried to pin it on the dirt track. Steve and Andy stayed glued on my wheel. The infield was tricky and definately easier to be leading and picking my own lines. Me, Steve, and Andy basically stayed together for the first lap. Andy fell away but Steve stayed right on me and definately had my attention. With no real hills to speak off, I had to figure out where to get time on him. Leaving the dirt track, there was the tricky turn with the run up to the stairs, with the re-mount on top then a quick plunge down the other side with a sharp left turn. I noticed I could re-mount and make the quick turn a little better, so I started to pin that section and the following grass section with the climb at the very end. From there, I needed to recover a bit through the start-finish area. The little grass climb just off the start was another place I could get a second or 2 each lap. Once back onto the dirt track, I just eased up and tried to freshen up. Steve would close in here every lap. This pattern went on for about 30 minutes. Fortunately I could get a couple more seconds each lap on the sections I was faster on that he could get me back on during the track and infield section. 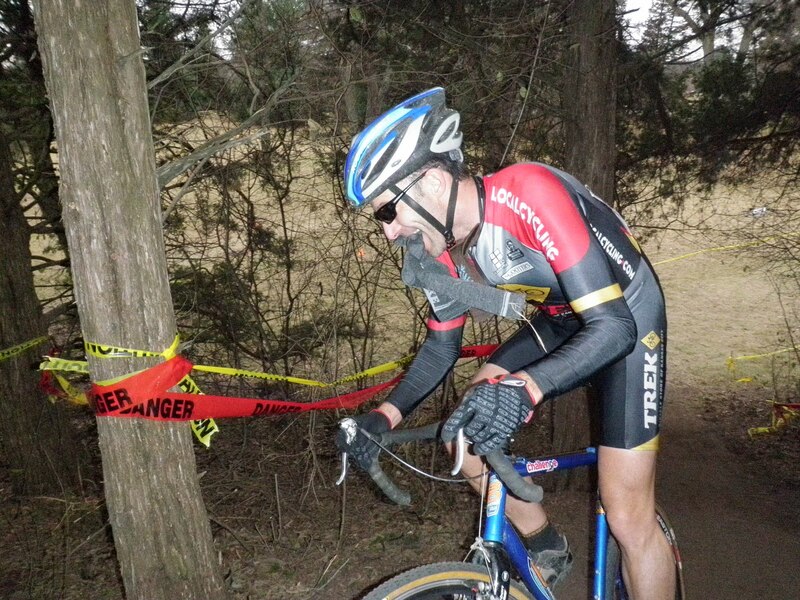 The un-seasonably warm air made the throat pretty dry and sore by the end but I hung on for the Masters 40+ win with Steve right behind me and Andy Lucas coming back from an early crash to get 3rd. Hung out and watched part of the open race. Those buys were flying. With a race the following morning, couldn't stick around for the finish. It was about 40 degrees warmer this time around. Perfect weather, bit chilly in the morning but nothing too cold. The course this year was more or less similar to last years: Pavement start with a hill and plenty of climbing. This is one of those courses were I spent about 90% of the course in your 3 biggest cogs and the other 10% in the bottom 3, not much in the middle. The pavement start was flat for 50 yards then a left 90 and up the hill another 50 yards. Sharp right onto the grass and into the bigger cogs. All the recent rain made the grass very spongy but not very muddy. In the Masters 35+ race, I got to the grass first. The first grass section had a steep downhill with a rutted out turn at the bottom, then a hard steep climb. It was farily easy to ride as long as you had a clear shot at it and low enough gear. My 42/26 was a manageble but sure could have used a 39. David Hayduk and Doug Plummer were never too far back so I just stayed steady and tried to use the sections of the course that suited me. The final pavement section through the start/finish area was a bit hairy at race speed, with a hard 180 left turn. The laps was really short and that combined with the steep nature of the course, the race got strung out really quick. I started catching the tail end of the field with about 4 to go. The Mens Open race wasn't until 2pm so I had a couple hours to sit around before warming up again. When doubling-up, the time between races is pretty important. This time I had 1 more hour between races than the previous weekend. It had warmed up quit a bit by the time the race got off. Bunch of fast guys on the line. Brian Jenson, Shad Shreiner, Aaron Elwell, Cameron Cambers, Jeff Winkler, Nate Woodman, and Chris Wallace among others. I got a good start and just got in line and held on. Jeff Winkler, Brian Jenson, and Shad Shreiner seemed to be off and running right away in a front group, then it was a group with me, Aaron, Cameron, Bill Marshall, Chris Wallace stayed together for a couple laps. I was feeling OK so I tried to take off and left that group and was in 4th but it was very short lived. Couldn't keep it going and got caught by those guys pretty quick, then starting go backwards. My legs were pretty dead and getting deader. Shad was flying and lapped me a few laps before the end, as did Jenson in 2nd, and Winkler 3rd. When Jenson passed me, I cut a turn a bit to hard and the back tire peeled off a bit. I could here it as i hit the high speed pavement section, so I hit the pit with 3 to go and got the spare bike. I was pretty dead at this point so the last 3 laps weren't too impressive. I couldn't ride the one long steep hill anymore. Last guy I could tell that was behind me was Bill Marshall but I couldn't see him anymore. Nate Woodman was having a really bad day but got close to me before the finish. Even going a slow as I was, I still caught the tail end of the field.